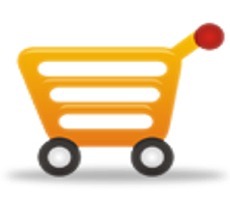 Helping you to find the model and serial number of your product. There may also be additional data on that tag which may be required. All this data should be handy when making a parts inquiry. These include the MFG manufacturing number (Amana), type number (Woods), run number (Jenn Air), series number (Maytag), B/M bill of material number (Maycor built fridges), style number (Westinghouse) or a service code (Thermador, Danby). 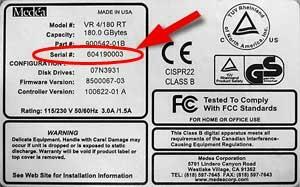 It is important that the exact and complete reference numbers be taken from the model plate on the appliance only. It is also important that you NOT rely on these numbers when found on the sales bill, shipping carton or owners manual (unless you copied it from the tag on the appliance). These areas usually only have partial information and may cause improper parts to be ordered. 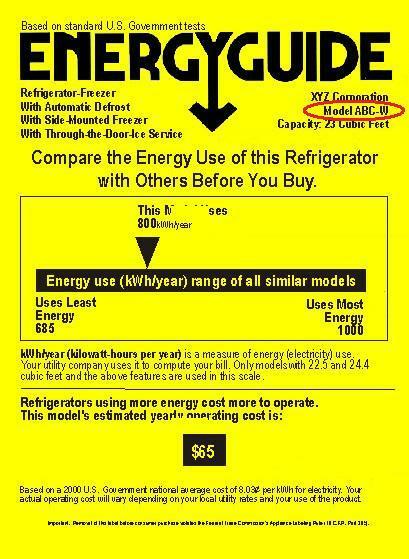 Additionally, the energy guide label (like the one show above) usually has only a partial model number listed and should also not be quoted. Moreover, when supplying the model number over the telephone, be aware that some letters sound similar and may be confused. Letters such as 'S' and 'F', 'M' and 'N', and 'B' and 'D' are the most frequently misheard. On these occasions try to make clear exactly which one you are referring to. E.g., 'S' as in Sam or 'M' as in Mary.